Producers Kevin McCollum, J. J. Abrams, Kenny Wax, Stage Presence Ltd. and Catherine Schreiber have announced that the Mischief Theatre production of The Play That Goes Wrong, the Olivier Award winning West End hit comedy, will arrive on Broadway this spring. The Play That Goes Wrong will begin performances Thursday, March 9 and officially open Sunday, April 2, 2017 at The Lyceum Theatre (149 West 45 Street). 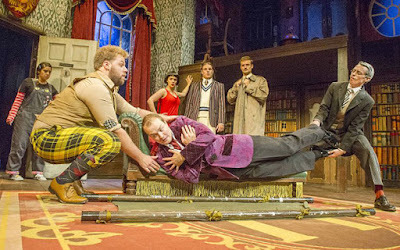 Co-written by Mischief Theatre company members Henry Lewis, Jonathan Sayer and Henry Shields, The Play That Goes Wrong is a riotous comedy about the theatre. The play introduces The ‘Cornley Polytechnic Drama Society’ who are attempting to put on a 1920s’ murder mystery, but as the title suggests, everything that can go wrong…does, as the accident prone thespians battle on against all the odds to get to their final curtain call. The Play That Goes Wrong will star the original West End cast featuring Matthew Cavendish,Bryony Corrigan, Rob Falconer, Dave Hearn, Henry Lewis, Charlie Russell, Jonathan Sayer, Henry Shields, Greg Tannahill and Nancy Zamit. Producer J. J. Abrams said "I have been a fan of theater all my life. Embarrassingly, I still have every Playbill, from the very first shows my grandmother took me to. When I saw The Play That Goes Wrong on the West End, I hadn't laughed that hard -- seen something as preposterously absurd or wonderfully hilarious -- in ages. To be part of the team bringing this inspired comedy to Broadway is a true honor. Whatever happens, I'm saving the Playbill." Awarded 2015 Olivier Award for Best New Comedy, 2014 Whatsonstage Best New Comedy and 2015 UK Broadwayworld Best New Play Awards, The Play That Goes Wrong is now in its third smash hit year on the West End and has announced a national tour that will visit 30 venues across the UK through to July 2017. It is a remarkable rags-to-riches story for a play which started its life at a London fringe venue with only four paying members of the public at the first performance, and has gone on to play to an audience of over half a million around the world. In addition to their current hit London production of The Play That Goes Wrong at The Duchess Theatre, Mischief Theatre’s The Comedy About A Bank Robbery plays The Criterion Theatre and their production of Peter Pan Goes Wrong just reopened at The Apollo Theatre to rave reviews, making Henry Lewis, Jonathan Sayer and Henry Shields the youngest ever writers to have three shows playing simultaneously in the West End. The Play That Goes Wrong is directed by Mark Bell, featuring set design by Nigel Hook,lighting design by Ric Mountjoy, sound design by Andy Johnson and costume design by Roberto Surace. The Play That Goes Wrong will be produced on Broadway by Kevin McCollum, JJ Abrams,Kenny Wax Ltd, Stage Presence Ltd and Catherine Schreiber.